Photo by: Brian Christensen, via Free Images. Calverton, NY - August 19, 2015 - There are still appointments left at Kent Animal Shelter for spay/neuters of Pit Bull Terrier-type dogs for Long Island residents this month for a special $20 rate, which includes a free doggie nail trim, during PetSmart Charities® annual “Primp Your Pit” campaign. 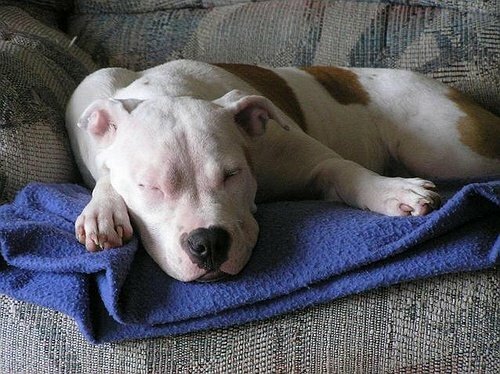 American Pit Bull Terriers are one of the most popular dogs in the country. Yet an estimated 70% of all dogs housed and euthanized in animal shelters are Pit Bull Terrier-type dogs. Sadly, myths and misunderstandings contribute to high shelter intake and low adoption rates of Pit Bull Terrier-type dogs of all ages. To reduce their shelter numbers, PetSmart Charities is providing grant funding to select animal welfare organizations across the nation so they can sterilize thousands of Pit Bull Terrier-type dogs during the August campaign. “Spaying/neutering your dog is the most effective way to prevent unwanted litters from being born that may ultimately end up in our local animal shelter,” says Pamela Green, Executive Director of Kent Animal Shelter. The American Veterinary Medical Association endorses spaying and neutering puppies as young as eight to 10 weeks old. Research shows that the procedure may improve the behavior and health of the pet, including reducing the risk of certain reproductive cancers and infections. Pit bull parents who wish to take advantage of this special offer must mention the “Primp Your Pit” promotion when they schedule their appointments. The promotion is based on availability and spaces are limited. Please visit www.KentAnimalShelter.com or call 631-727-5731 for more information or to schedule an appointment. The Kent Animal Shelter clinic is open Monday through Saturday from 10AM to 4PM by appointment. About Kent Animal Shelter: Kent Animal Shelter is a 501C3 organization established in 1968 in Calverton, NY that provides a no-kill haven for homeless animals, adoption services, a spay/neuter clinic, and humane education. More information is available at www.KentAnimalShelter.com or by calling 631-727-5731. About PetSmart Charities: PetSmart Charities, Inc. is a nonprofit animal welfare organization that saves the lives of homeless pets. More than 400,000 dogs and cats find homes each year through its adoption program in all PetSmart® stores and its sponsored adoption events. PetSmart Charities grants more money to directly help pets in need than any other animal welfare group in North America, with a focus on funding spay/neuter services that help communities solve pet overpopulation. PetSmart Charities is a 501(c)(3) organization, separate from PetSmart, Inc.
Subject: LongIsland.com - Your Name sent you Article details of "Kent Animal Shelter Urges “Pit Bull” Parents to Prevent Unwanted Litters during August “Primp Your Pit” Campaign"